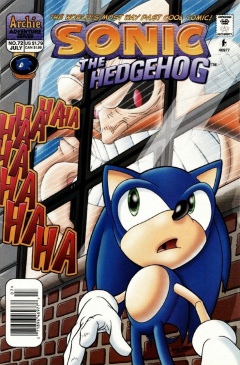 Sonic the Hedgehog 72 is the seventy-second issue of the Sonic the Hedgehog comic. This issue features two stories, the main story, entitled "I, Robotnik", and the back up story, "Tales of The Great War: Part One: The Shot Heard 'Round The World!" Sonic The Hedgehog, The Freedom Fighters, Nate Morgan, plus Sonic's closest family, Uncle Chuck, Jules The Hegehog and Bernadette The Hedgehog, are all gathered in the home of Sonic's parents. Sonic is fiddling with a newly-invented device, the TV-like Telecrate. Built by Nate and Rotor Walrus using leftover Robotnik technology, the Telecrate has been mass produced in order to all citizens to view the king's first address to his newly-restored kingdom. Sally confesses that even she does not know what her father intends to say tonight; she just knows that she's expected to be back at the castle in time for the address. Rotor takes the moment to inform his companions that he is leaving them all to go find his family, last seen as mind controlled Robotnik slaves toiling in the arctic. They all wish him good luck, and then good bye. Once at the castle, Nate and Sally are greeted by Sally's father. He reveals that he that he intends to announce the status of Queen Alicia Acorn, as well as the recent defeat of Ixis Naugus. Without further ado, the broadcast begins, and is viewed by the Hedgehog family, the Freedom Fighters, Kodos Lion-on a stolen Telecrate-and even John Doe and his wife Jane. But high above the world so high, yet another satellite comes to life. "N-Sat Unit back online. And commencing location of target. Target acquired, system locked, and beginning activation... NOW!" The king's historic speech fades to static, and the sudden silence is soon broken by a mysterious voice in narration: "K-Bot presents, for the first and only time, the illustrious biography of the world-renowned super-scientist known by any half-wit with half-a-brain cell as... DOCTOR ROBOTNIK-- The greatest Overlander who ever lived!" Everyone watching is shocked and dismayed by this preempting program, but powerless to stop its continuance. The narrator begins, detailing the despot's early life, born the second of two sons to Ivo and Bertha Kintobor, then briefly and dismissively mentioning his brother Colin. It then touches upon his time as Nate Morgan's lab assistant; insisting that it wasn't long before Julian himself was the lab leader, to the astonishment of a watching Nate. It is then revealed that, in the years during The Great War (a conflict the narrator forgets the name of), Julian conceived of the ultimate weapon of mass destruction, The Ultimate Ultimate Annihilator cannon, but the device needed to be powered by a rare mineral ore. Before the device could be fully realized, Julian was arrested and sentenced by his own brother to prison for the crime of wanting to use his fellow Overlanders as test subjects in his experiments. Rather than face a harsh ten-year prison term, Julian fled his homeland, barely escaping with his life and ending up in the Mobian badlands. It was there he was happened upon by two hedgehogs, "savages", the narrator calls them (Chuck and Jules were said savages, watching on in disbelief), who then take him to meet their leader, King Acorn. The narrator describes still-watching king as a "Sucker who could spot greatness in a split second!" promptly insisting that it wasn't long before The King practically handed over the realm to Julian. First, the narrator goes on, the sitting Warlord, Kodos (also watching the broadcast), had to be dealt with. After learning everything Kodos had to offer, Julian sent him to The Zone of Silence. Then, after Julian became Warlord, Julian led the Mobian forces and the tide of war began to change in Mobotropolis' favor. With the victories piling up, Julian was payed a visit by his "Dim-wit" nephew Snively. Snively pledged his allegiance to his uncle, and the two conspired to reshape the face of the entire world. Doing so would require an artificial army, coupled with the sabotage of Charles Hedgehog's newly-invented Roboticizer. Thus, on that fateful day when the gigantic flagship appeared over Mobotropolis' sky, Doctor Robotnik ascended to power. The narrator propagandizing all the way: King Acorn dismissed as one of the "Ignorant few" who adhered to tradition and opposed Robotnik's "Reforms". The roboticization and enslavement of the populace in factories described as "Job creation", that the citizens "volunteered for". The narrator condescendingly mentions Sonic and The Freedom Fighers as "Rabble Rousers", a note to which a watching Antoine foolishly cheers to. The narrator pushes on, touching upon the despot's visit to his former homeland, a land mysteriously abandoned. It mentions his supposed demise at the hands of E.V.E., as well as his subsequent return to Mobius as enable by his alternate universe counterpart, Robo-Robotnik. The voice propagandizes one last time, framing the doctor's ultimate defeat at the hands of Sonic as a sacrifice to the service of the planet. The voice then signs off and disappears, as cryptically as it had signed on. Sally immediately contacts Sonic, and they immediately assume the cause of the pirate broadcast was due to the Telecrates' inclusion of Robotnik technology. Responding to the worries of his parents and uncle, Sonic then admits to being overwhelmed to having his family with him again. Though he missed being a Freedom Fighter, he is now fully committed to enjoying a peaceful life with his parents. He walks outside, giving one last glance to an idle Telecrate. Unbeknownst to him, in a location far removed from Knothole Village, Snively, who survived the explosion on Big Kahuna Island, is confronted by a familiar fat figure. The towering figure shows all Snively's acts of treachery, branding him a traitor. Tales of The Great War Part One: The Shot Heard 'Round The World! Several generations in the past, a chance meeting takes place between an Overlander and a Mobian: in this case, a pair of youths named Emerson and Paladin. The two happen upon each other in the forest bordering the Badlands separating their two homelands, they are immediately friendly. Paladin reveals that he has been out target shooting, and invites Emerson to try out his gun. Thrown back by the recoil, Emerson returns the gun to Paladin, who then sets his sights on a moving target: a nearby bird. Realizing his intent, Emerson gets in the way of the shot, taking the bullet for the bird. Horrified by the consequences of his action, Paladin flees, leaving Emerson's body to be found by his father: Theodore Acorn. Rather than seek vengeance, however, the king forbade all contact with Overlanders, and the Kingdom of Acorn would from that point forward hold guns and similar weapons in contempt. The tale is revealed to be included in one of Kirby's volumes, being read by Tails, Amy Rose, and Jeremiah. The lead story's title, "I, Robotnik", is an homage to Isaac Asimov's renowned science fiction story, "I, Robot". The second story's title, "The Shot Heard 'Round The World", is a reference to a popular phrase describing the opening battle of the American Revolutionary War, The Battle of Lexington and Concord. Food mascot Chester Cheetah makes an apparent cameo as the director of the King's broadcast. Robotnik's takeover mirrors the opening of the SatAM television series.